Eric Foner, DeWitt Clinton Professor Emeritus of History at Columbia University, is one of this country's most prominent historians. He received his doctoral degree at Columbia under the supervision of Richard Hofstadter. He is one of only two persons to serve as president of the three major professional organizations: the Organization of American Historians, American Historical Association, and Society of American Historians, and one of a handful to have won the Bancroft and Pulitzer Prizes in the same year. Professor Foner's publications have concentrated on the intersections of intellectual, political and social history, and the history of American race relations. His best-known books are: Free Soil, Free Labor, Free Men: The Ideology of the Republican Party Before the Civil War (1970; reissued with new preface 1995) Tom Paine and Revolutionary America (1976); Nothing But Freedom: Emancipation and Its Legacy (1983); Reconstruction: America's Unfinished Revolution, 1863-1877 (1988) (winner, among other awards, of the Bancroft Prize, Parkman Prize, and Los Angeles Times Book Award; The Reader's Companion to American History (with John A. Garraty, 1991); The Story of American Freedom (1998); Who Owns History? Rethinking the Past in a Changing World (2002); his survey textbook of American history, Give Me Liberty! An American History (2004); The Fiery Trial: Abraham Lincoln and American Slavery (2010) (winner, among other awards, of the Bancroft Prize, Pulitzer Prize for History, and The Lincoln Prize); and Gateway to Freedom: The Hidden History of the Underground Railroad, ( 2015) (winner of the American History Book Prize by the New-York Historical Society. His latest book, Battles for Freedom: The Use and Abuse of American History (2017), is a collection of essays from The Nation magazine. His books have been translated into Chinese, Korean, Italian, Japanese, Portuguese, and Spanish. Eric Foner has also been the co-curator, with Olivia Mahoney, of two prize-winning exhibitions on American history: A House Divided: America in the Age of Lincoln, which opened at the Chicago Historical Society in 1990, and America's Reconstruction: People and Politics After the Civil War, which opened at the Virginia Historical Society in 1995 and traveled to several other locations. He revised the presentation of American history at the Hall of Presidents at Disney World, and Meet Mr. Lincoln at Disneyland, and has served as consultant to several National Parks Service historical sites and historical museums. 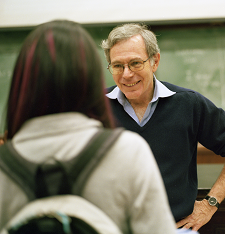 Eric Foner is a winner of the Great Teacher Award from the Society of Columbia Graduates (1991), and the Presidential Award for Outstanding Teaching from Columbia University (2006). He was named Scholar of the Year by the New York Council for the Humanities in 1995. In 2006, he received the Kidger Award for Excellence in Teaching and Scholarship from the New England History Teachers Association. In 2014 he was awarded the Gold Medal by the National Institute of Social Sciences. He is an elected fellow of the American Academy of Arts and Sciences and the British Academy, and has been awarded honorary degrees by Iona College, Queen Mary University of London, the State University of New York, Dartmouth College, Lehigh University, and Princeton University. He has taught at Cambridge University as Pitt Professor of American History and Institutions, Oxford University as Harmsworth Professor of American History, Moscow State University as Fulbright Professor, and at Queen Mary, University of London as Leverhulme Visiting Scholar. In 2015 he received the Everyday Hero of Freedom Award from the National Underground Railroad Freedom Center in Cincinnati. He serves on the editorial boards of Past and Present and The Nation, and has written for the New York Times, Washington Post, Los Angeles Times, London Review of Books, and many other publications, and has appeared on numerous television and radio shows, including Charlie Rose, Book Notes, The Daily Show with Jon Stewart, The Colbert Report, Bill Moyers Journal, Fresh Air, and All Things Considered, and in historical documentaries on PBS and the History Channel. He was the on-camera historian for "Freedom: A History of Us," on PBS in 2003. He has lectured extensively to both academic and non-academic audiences. In 2007, a group of Professor Foner's former graduate students published Contested Democracy: Freedom, Race, and Power in American History, edited by Manisha Sinha and Penny Von Eschen, a collection of essays, or "festschrift," in his honor. Foner's works have been highly praised in scholarly journals and by reviews in periodicals across the political spectrum. In The Nation, Theodore Rosengarten wrote that Reconstruction is "monumental in scope ... a feat of research and synthesis that is not likely to be repeated for a generation." The introduction to a recent collection of essays on the Civil War era refers to Reconstruction as "one of the masterworks of the historical profession." Robert H. Ferrell, in the National Review declared that The Story of American Freedom "approaches brilliance." Of The Fiery Trial, Gordon Berg observed in Civil War Times, "looking for flaws in an Eric Foner book is like looking for flaws in the Hope Diamond; it is a fool's errand." In the Los Angeles Times, Wendy Smith wrote of Gateway to Freedom, "intellectually probing and emotionally resonant, [it] reminds us that history can be as stirring as the most gripping fiction." In a recent book review, Professor Steven Hahn of the University of Pennsylvania wrote of Eric Foner: "Like his mentor Richard Hofstadter, he has had an enormous influence on how other historians, as well as a good cut of the general reading public, have come to think about American history. This is the result of his voluminous scholarship and of his decades as a teacher. Indeed, when one considers the chronological and topical range of Foner's many books and essays--not to mention those of his doctoral students--only Hofstadter, C. Vann Woodward, David Brion Davis, and, in an earlier era, Charles Beard (who was also at Columbia) would seem to be his genuine rivals in impact and accomplishment." On a somewhat different note, the Oklahoma Gazette recently wrote of a lecture by Professor Foner at Oklahoma University, "suffice it to say that his giving a free lecture on OU's campus is just really, incredibly, super cool." VIEW SESSION AT ORGANIZATION OF AMERICAN HISTORIANS ANNUAL MEETING ON ERIC FONER'S "RECONSTRUCTION AT 25"
VIEW ONLINE EXHIBIT "A HOUSE DIVIDED: AMERICA IN THE AGE OF LINCOLN"
VIEW ONLINE EXHIBIT "AMERICA'S RECONSTRUCTION: PEOPLE AND POLITICS AFTER THE CIVIL WAR"